Your action movies nowadays with your Jason Stathams and John Cenas and Jeremy Renners, yeah, they’re OK – they’re not gonna stick in my craw, dig? They’re not the Oatmeal of Legend. Heckfire, I only enjoyed “The Expendables” and its sequel because I am the Hooded, Jersey Tap Water Drinking, Ornery yet Oratory Nostalgia-Gobblin’ Parademon Just Southwest and Seventy-Five Hundred Miles of Apokolips; I was not looking for action – I was looking for The Truth. Savvy? Copycats Carve Their Epitaphs. I’ll tell you what stays with me about “Die Hard”, after my 39th viewing of the movie yesterday afternoon – Two of the thirteen terrorists live. They’re still out there, kids, looking for a plotline, ammunition, and the LAPD. Oh crap! The LAPD – give me the LAPD as portrayed in action flicks from 1985-1994 – it’s like science fiction – Southern California Badge-Carriers were ubermensch; they were super-clean and streamlined androids with a perpetual soundtrack. The LAPD in this light has been M.I.A. since “Speed”, IMHO. You may not remember the two terrorists who survive Nakatomipocalypse. Friends…you’ll just have to watch the movie again. Yippie-Kai-Yay, Motherf***er, and Get Ready Yer Pause Buttons. 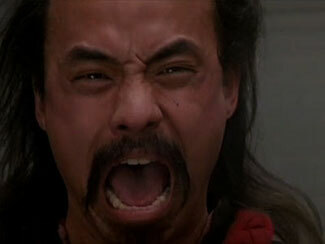 On Million Bonus Points for the Big Trouble in Little China screenshot.